زعفران گران‌بهاترین ادویه جهاناست که امروزه کاربردهای وسیعی درصنایع غذایی، دارویی، صنعتی و رنگرزی دارد. متوسط عملکرد در ایران 83/4 کیلوگرم در هکتار می‌باشد. این تحقیق با هدف بررسی اثر وزن و تراکم بنه برعملکرد و اجزاء عملکردگیاه زعفران تحت شرایط کشت خاکی و هیدروپونیک انجام گرفت. برای این منظور، سه اندازه مختلف بنه (8-6 ،10-8 و 10 گرم به بالا) و سه تراکم بنه (50،100و 150 بنه در مترمربع) در آزمایش فاکتوریل درقالب طرح کاملا تصادفی در سه تکرار درداخل تونل پلاستیکی پیش‌بینی شد. صفات مورد بررسی در این طرح عبارتند از تعداد گل ، وزن تر و خشک گل، وزن تر و خشک کلاله ، وزن تر و خشک خامه و وزن تر و خشک کلاله و خامه. نتایج نشان داد که اثرات اصلی نوع بستر، اندازه و تراکم بنه در تمامی صفات معنی‌داربود. اثرات متقابل نوع بسترو اندازه بنه درتمامی صفات درسطح 5 در صد معنی‌دار بوده به جزء وزن خشک گل، وزن خشک کلاله وخامه که تفاوت معنی‌دار دیده نشده است. همچنین اثرات متقابل بین نوع بستر و تراکم بنه، اندازه و تراکم بنه و اثرات متقابل بین نوع بستر، اندازه و تراکم بنه درهیچ کدام از صفات موردمطالعه معنی‌دار نشده است. بیشترین عملکرد زعفران در بنه‌های 10 گرم به بالا به‌دست آمد که باکاهش اندازه بنه، تمامی صفات کاهش معنی داری پیدا کرد، همچنین نتایج نشان داد که کمترین عملکرد (وزن خشک کلاله) در بستر کشت هیدروپونیک با تراکم 50 بنه در مترمربع به میزان 14/4 کیلو گرم در هکتار و بیشترین عملکرد در بستر کشت خاکی و با تراکم 150 بنه در مترمربع معادل 36/7 کیلوگرم در هکتار و در سال اول حاصل شد. Saffron is the most precious spice crop in the world which nowadays has nutritional, medical and industrial importance. Its average yield is 4.83 kg/ha in Iran. The research was conducted to investigate the effect of corm weight and its density on yield and yield components of saffron under soil, hydroponic and plastic tunnel conditions. The effect of three different weights of corm (6-8, 8-10 and more than 10 g) and also three different densities of corm (50, 100 and 150 corms per m²) was investigated in factorial experiment based on CRD with three replications. The traits which were investigated included: number of flower, fresh weight of flower, fresh and dry weight of stigma and style, and economic yield. The results showed that the main effects of bed types. Weight and corm density were significant in all traits. Interactions of bed type and corm weight were significant at 5% except for flower dry weight, and dry weight of stigma + style that were not significant .As well, Interactions of bed type and corm density, corm weight and density and all interactions of bed type ,corm weight and density were not significant in all traits. The heavier corms (more than 10 g) provided the highest yield. By decreasing corm weight, all traits were reduced significantly. Also the results showed that least yield(stigma dry weight) obtained from hydroponic cultivation with 50/ m² yielded 4.14 kg/ha and increase in yield (dry weight of stigma) was obtained under soil cultivation and in the density of 150 corms/m² economical yield was equivalent to 7.36 kg/ha in the first year. Alvarez-orti, M., Gomez-Gomez, L., Rubio, A., Escribano, J., Pardo, J., Jimenez, F., and Fernandez, J.A. 2004. Development and gene expression in saffron corms. Acta Horticulture 650: 141-148. Benabaji, M.H., mokhtarian, A., and Tavakoli Kakhki, H.R. 2012. The effects of plant density and corms size on saffron (Crocus sativus L.) corm production in nursery. In 4th International saffron symposium. October, 22-25. Kashmir, India. Cavusoglu, A., Erkel, E.I., and Sulusogulu, M. 2008. Saffron (Crocus sativus L.) studies with two mother corm dimensions on yield and harvest period under greenhouse conditions. The1st international symposium on medicinal plants. 15-16 October, Jordan. Daneshvar, M.H. and Jamalpour, Z. 2012. Study of corm size and planting depth effectiveness on flowering index and leaf number of saffron (Crocus sativus L.) in Mollasani (Khozestan) climate condition, Iran. In4th International Saffron Symposium. October, 22-25. Kashmir.India. De-maastro, G. and Ruta, C. 1993. Relative between corm size and saffron (Crocus sativus L.) flowering. Acta Horticulture 344: 512-517. Gowhar, A.., Nehvi, F.A., Ameeque, A., Naseeri, S., Iqbal, A., and Mand Sameer, S. 2012. Effect of corm size and weight on daughter corm formation in saffron (Crocus sativus L.) In 4th International saffron Symposium. October, 22-25. Kashmir, India. Koocheki, A., Rezvani Moghadam, P., and Mollafilabi, A. 2012b. Effect of plant density and type on saffron (Crocus sativus L.) yield and yield components. In 4th international saffron symposium. October, 22-25. Kashmir, India. Koocheki, A., Siahmarguee, A., Azizi, G., Jahani, M., and Alimoradi, L. 2009a. The effect of plant density and depth on agronomic characteristic of saffron (Crocus sativus L.). Paper presentedat the 3rd international symposium on saffron. Forthcoming challenges in cultivation, Research and Economics. May, 20-23. Korokos, Kozami, Greece. Koocheki, A., Tabrizi, L., Jahani, M., Mohammad- Abdi, A.A., and Mahdavi Damghani, M. 2009b. Performance of saffron (Crocus sativus L.) under different planting patterns and high corm density. Paper presented at the 3rd international symposium on saffron. Koocheki, A., rezvani Moghadam, P., Mollafilabi, A., and Seyyedi, S.M. 2012a. Effect of high corm planting density and manure flower and corm yield of saffron (Crocus sativus L.) In 4t international saffron symposium. October, 22-25. Kashmir, India. Mc-Gimpssey, G.A., Douglas, M.H., and Wallace, A.R., 1997. Evaluation of saffron (Crocus sativus L.) production in New Zealand. New Zealand Journal of Crop and Horticulture Sciences 25: 159-168. Molina, R.V., Renau-Morta, B., Nebauer, S.G., Garcia-Luis, A., and Guardiola, J.L. 2010. Greenhouse saffron culture-Temperature effects on flower emergence and vegetative growth of the plants. Proceeding of the 3th international symposium on saffron: Forthcoming Challenges in Cultivation, Research and Economics. Acta Horticulturae 850: 91-98. Molina, R.V., Valero, M., Navaro, Y., Garcia Luis, A., and Guardiola, J.L. 2004. Temperature effects on flower formation in saffron (Crocus sativus L.). Scientia Horticulturae 103: 361-3790. Mollafilabi, A. 2012. Effect of extensive range of corm weights on yield components and flowering characters of saffron (Crocus sativus L.) under greenhouse conditions. In 4th international safron symposium. October, 22-25. Kashmir, India. Naderi Dabbagh, H., Shahi, M., Khajebashi, S.M., Banitaba, A., and ehdashti, V.M. 2008. Effect of density and planting depth on yield and productivity period of saffron farms in Esfahan, Plant and Seed 24: 657-643. Negbi, M. 1999. Saffron cultivation: past, present and future prospects. In: Negbi, M (Ed), Saffron, (Crocus sativus L.) Harwood Academic publishers, Australia, pp. 1-18. Pandy, D., and Srivastava, R.P. 1979. A note on the effect of size of corms on the sprouting and flowering of saffron. Progressive Horticulture 6: 89-92. Rashed Mohassel, M.H., Bagheri, A., Sadeghi, B., and Hemmati Kakhki, A. 1989. Report of group to Spain about saffron. 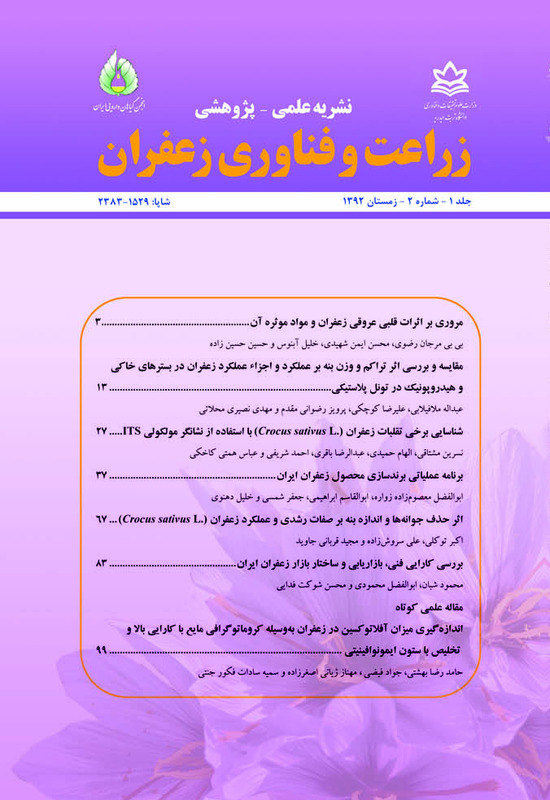 A publication of IROST, Khorasan, Iran. p. 55. Rezvani Moghaddam, P., Khorramdel, S., Aminghafori, A., Shabahang, J and Asadi, G.A. 2012. The effects of mushriimcompost rate and corm density on corm yield and stigma yield of saffron (Crocus sativus L.). In 4th international saffron symposium. October, 22-25. Kashmir, India. Sadeghi, B. 2012. Effect of corm weight on Saffron (Crocus sativus L.) flowering (Research II). In 4th international saffron symposium. October, 22-25. Kashmir, India. Schwarz, M. 1994. Soilless culture management. Springer Verlag Germany P. 245. Sourel, F., and Weathers, P.J. 2000. The growth of saffron (Crocus sativus L.) in aeroponics and hydroponics. Journal of herbal, spices and medicinal plants. 7(3): 113-127. Temperini, O., Rea, R., Temperini, A., Colla, G., and Rouphael. 2009. Evaluation of saffron (Crocus sativus L.) production in Italy: Effect of the age of saffron fields and plant and plant density. Food, Agriculture and Environment. 7: 19-23.